Did you know that the human palm is made up from 27 bones, 28 joints and 33 muscles? Everyone’s fingerprints are unique as a result of genetics, but the same does not apply to the shape of one’s nails as they develop during the existence of every man and woman. We know how to professionally take care of your nails and you can find all the high-tech instruments needed for manicure and pedicure with us. For more than 20 years already, ‘2 Storks’ has been offering all necessary tools for manicure and pedicure both as sets and as separate items. Healthy nails grow by about 0.1 mm every day and should the care given be with unfit instruments, then this can result in damages to the growth of the nails as well as their fragility. The best way to trim nails is by using nippers or curved scissors. The final shape of nails is easily given by using the coarse and fine sides of a nail file. The cuticles, on the other hand, require much more attention. For the perfect shaping of extra sensitive cuticles we offer fine pushers and lifters as well as precision sharpened nippers and scissors. 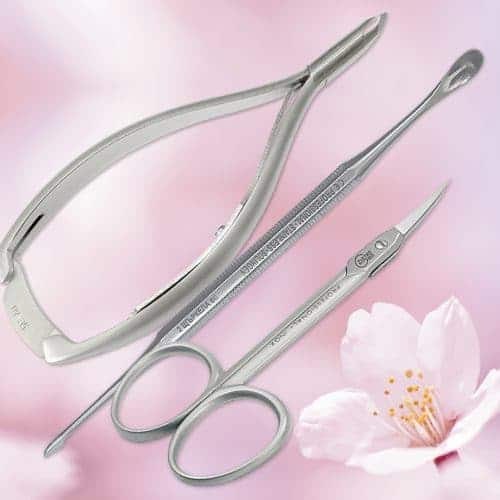 “The 2 Storks” offers professional, sterilizable instruments for both medical and cosmetic manicures and pedicures, which will surprise you with the great correlation between price, quality, functionality, effectiveness, design and ergo-dynamic properties. Because only “The 2 Storks BG” know what’s good from head to toe.